Announcing our new Promotional Products Website! This entry was posted on October 11, 2017 by Jessica Anderson. 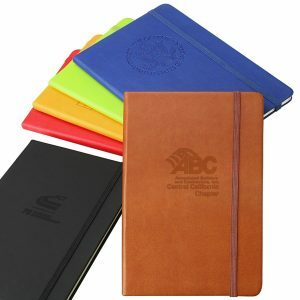 Our new promotional products website, check it out! We had a big summer, closing our Issaquah showroom and consolidating in our Renton production facility. Now that we are all settled in our space, it's time to focus on growing our business! Tom and I decided to launch a new website for promotional products, full of great personalized items for businesses, schools, and organizations. To get to our new site, just click the top box on our navigation banner that says "Promo Products" and you'll be directed there! We recently completed an order of these beautiful journals for EO Seattle. There are so many fun items on the site, all from the best vendors in the country. Reusable bags for shopping, drawstring sports bags for schools or teams, every kind of personalized pen imaginable for your staff or customers, team spirit stuff for schools such as rally towels and pompoms, office supplies from notepads to mouse pads, lanyards for trade shows, and drink ware such as coffee mugs to BPA free water bottles are all on the site, plus so much more! If you already order awards from us and need personalized products, please think of us. our same outstanding customer service team of Janice, Mika and Mike can help you choose the perfect product for your need, all within your budget. We would love the opportunity to work with you. Browse our new promo products site, there's so many fun things to see!